THE 2-HR. ZIP LINE TOUR WITH LUNCH. INCLUDES ALLSIX SEPARATE AND TOTALLY DIFFERENT SECTIONS, FLY SIDE BY SIDE ON TWIN AND TRIPLE LINES. 1ST DEPARTURE DECK AT 11,200 FEET OF ALTITUDE. DOUBLE OVERHEAD CABLES ON EVERY LINE PLUS DOUBLE HOOKUP ON THE HARNESS. DEPARTURE DECKS FLAT ON THE MOUNTAIN. AUTOMATIC BRAKING SYSTEM, NO SELF-BRAKING. 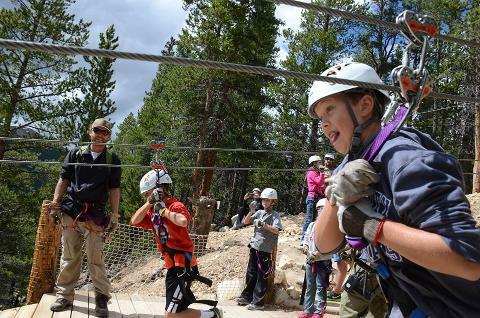 Check in at our Base Camp at 6492 Highway 91 at 11:00 a.m.. Meet your professional zip line guides and get all of your equipment. We provide harness, helmets and gloves. Please bring sunglasses for eye protection and wear comfortable walking shoes. Long pants are recommended, closed toed shoes like hiking boots or sneakers are most appropriate. ALL OF OUR TRAILS ARE DOWN-HILL SO IT'S EASY WALKING. TEMPERATURES GET VERY WARM IN THE SUMMER IN MOST PARTS OF THE SURROUNDING AREA. THAT INCLUDES DENVER TO THE EAST, BUENA VISTA TO THE SOUTH, AND AREAS WEST OF VAIL. It's a different world there but It is always COOL AND COMFORTABLE ON OUR PROPERTY EVEN IN THE MIDDLE OF SUMMER so bring an extra layer, sweater or hoodie, just in case.. Feel free to carry a small back pack for bottled water or a cell phone. An independent photo service is on site but it's OK to take photos with camera or cell phone. Complimentary raincoats are provided in the event of passing showers. After you are all geared up, it's time for flight training school. A brief safety talk will be followed by a practice zip on a training line. Look overhead and see those TWO HEAVY CABLES and that double hookup on your harness. You are not flying on one wire! Every element on your hook-up is backed up. Now you're comfortable and ready to go. Don't worry bout a ting cause every little ting gonna be OK. This tour is appropriate for everyone including children, minimum weight 50 pounds and Seniors, maximum weight is 260. There is a bit of walking on the trails between the zip lines but the hikes are short and down hill. Guides will always lend a helping hand if needed. Various kinds of fun vehicles are used to shuttle guests from Base Camp to the first departure deck at 11,200 feet of altitude. We use rugged military style trucks, four wheel drive vans and even Polaris Rangers to climb the steep winding trails up the Mountain. The choice depends on the trail conditions and number of guests. On the way up the mountain guests might be surprised to catch a glimpse of many species of wildlife including deer, elk, bunny rabbits and various other varmints. Our PRIVATE PROPERTY in this area consists of approximately 2,500 acres of land soaring from 10,000' at base to 12,800 feet on the Continental Divide. It is rough and rugged and totally unspoiled. Watch for remnants and ruins from the old mining days during the ride up the mountain. There are 40 old historic patented gold mining claims on the property with names like The Golden Treasure, Druzzy Wilson, The Copper Prince and General Grant but no mining operations exist at this time. The first departure deck is located near our cozy mountain Yurt. You may enjoy your box lunch in this area. It comes from a local restaurant and includes a generous deli sandwich, chips and dessert. Options are vegetarian, gluten free or regular. Bottled water and other beverages are complimentary. The views are spectacular! You are surrounded by the tallest mountains in North America. We are on the slopes of Mount Arkansas, it's 13,795 feet tall, with the fabulous 14ers Mount Massive and Mount Elbert, to the south. This area is home to the Headwaters of the Arkansas River. It comes across our property as a idyllic innocent stream and turns into the mighty Arkansas just south of Leadville. The first zip line is a Twin. That means two separate zip lines, standing side by size. Two people will get hooked up at the same time while their guides get them ready to go. When all is ready, one guide will hook up and glide away. You can see him as he lands on the deck in the far distance. When he is ready and gives the signal, other guides will undo your restraining tether. Take a few tentative steps forward and slowly the wire will take your weight. The decks slant slowly downward so just Relax and Glide away. Our Automatic Braking System will bring you to a smooth and safe stop with your guide assisting. 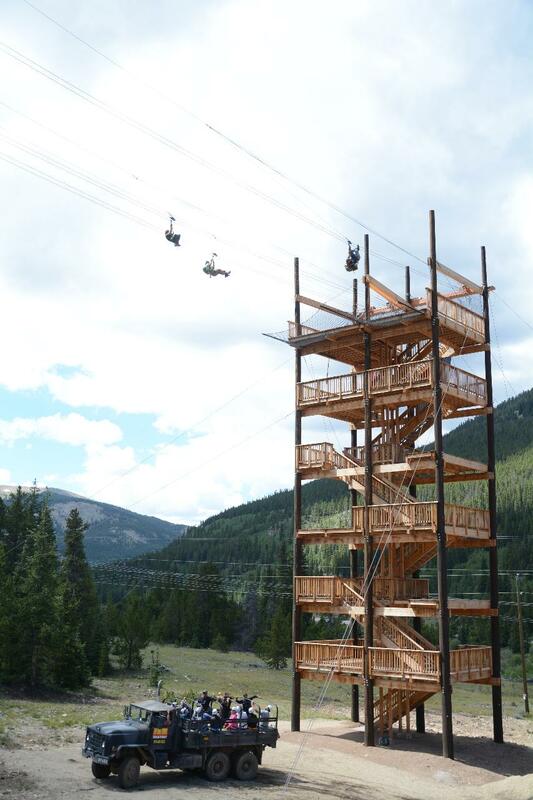 This tour includes all six sections of the zip line. You will do four twin lines, one single, and #6 the BIG NUGGET. It's a Triple with three zip lines descending from the high mountains then landing on the massive and beautiful 100 foot tall sky tower. This is the only tower on the tour. We don't have to climb ladders into trees or onto towers to get high. Top of the Rockies is naturally high with all departure areas at 10,000 to 11,500 feet of altitude. 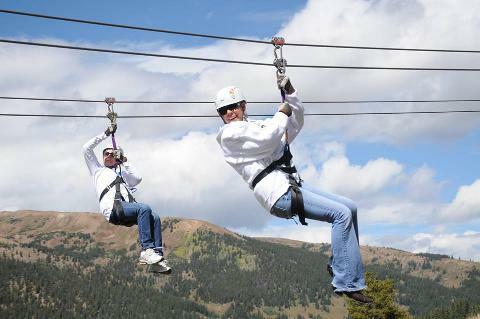 Experience totally different elements of speed, distance off the ground and terrain on every zip lining area. Fly over streams, deep canyons, waterfalls, and the track for the Leadville Colorado and Southern Railroad Train. Flying over the train depends on timing but you will hear the whistle blow as it comes close. 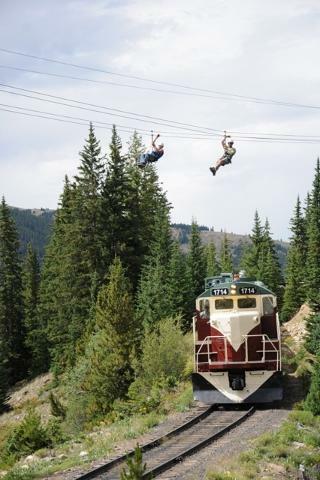 Guests on the train will be waving and calling out to the zipliners. It's all fun, all the time. 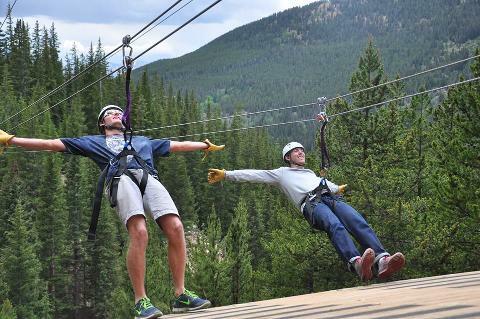 This zip Line tour is unlike any other zip line tour because of the high physical location and the way the course is laid out. Guests say this is the best zip line they have done, the best in the world, the best in the country and way better than Costa Rica. 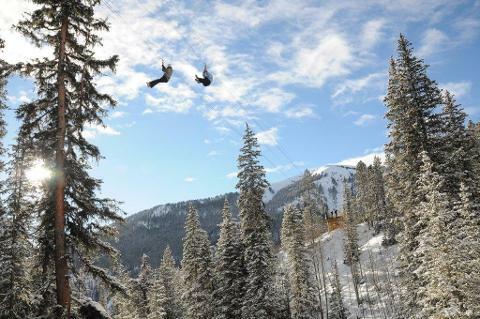 Check our reviews on our Websites, www.topoftherockieszipline.com, www.whitemountainsnowmobiletours.com, Trip Advisor, Yelp and Google. Come on out and see if you agree. We are a locally owned and operated business, built in 2012, inspected every year and registered with the State of Colorado. Make a reservation to come out soon and enjoy our beautiful mountain home and staff. Children must be 50 pounds to participate. Age 12 is a child for charging purposes, 13 is an adult. Adults must be 260 pounds or less to participate. No smoking is allowed any where on the property. Everyone must sign a standard Liability Policy. LUNCH IS FROM CITY ON A HILL RESTAURANT. IT IS A DELI SANDWICH, CHIPS, DESERT AND THE CHEF'S CHOICE OF THE DAY. OPTIONS ARE GLUTEN FREE, REGULAR OR VEGETARIAN. Use your cell phone for navigation. 6492 Highway 91, Leadville, Colorado 80461 is the physical address. However, we are not located in the town of Leadville. We are about 8 miles north of Leadville on Highway 91. From Copper Mountain Exit 195, go south on Highway 91, til you see Mile Marker 7 on the left. Slow down on Marker 7 and get ready to turn left into our driveway. Check in at the bright red building. From Buena Vista and points south, drive north on Highway 91 until you see mile Marker 6 on the right, turn right into our driveway marked with red/white and blue flags.